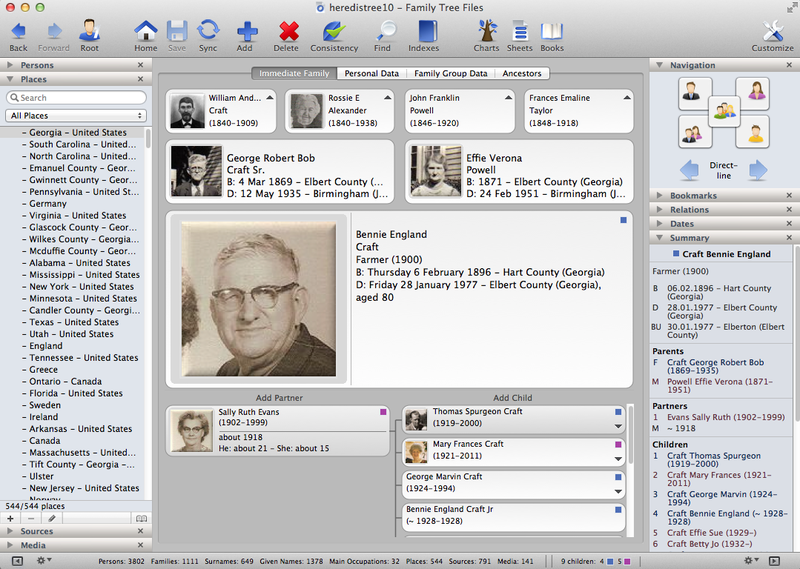 As a Mac user, genealogy software programs were once very limited. Back when I got started there were few options and one real standout company: Reunion. Over the last few years however, more companies have introduced Mac versions, but I haven't found any product that would tempt me away from Reunion. I was recently invited to explore Heredis for Mac and have found a product that really stands up to the competition. Heredis is a French based software company and there is certainly a European feeling to it. 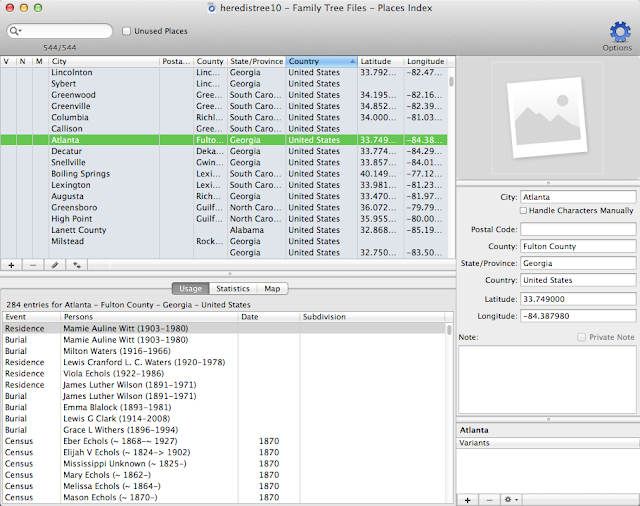 For example, the default for the dates are dd.mm.yyy instead of the more American mm.dd.yyyy (though in most cases you can change this to the more standard genealogical dd mmm yyyy). 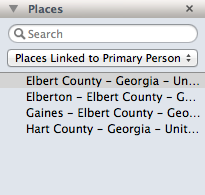 And if you don't specify that Georgia is a state in the US, the map will pick the country by default. It's something to get used to, but soon becomes just a little quirk. You can see that there are a lot of features here. On the left you can view a list of People, Places, Sources and Media in your tree. Each list is searchable or sortable, like People. You can search by name or by criteria such as education, religion, childless families, etc. Places can be sorted to show only places that apply to the person you're viewing. Clicking on a Place shows you a map of that place, and you can also see a list of people associated with that place. I really like all the things you can do with Places, so I'll share a few screenshots. The middle section of the screen details the individual you're looking at. 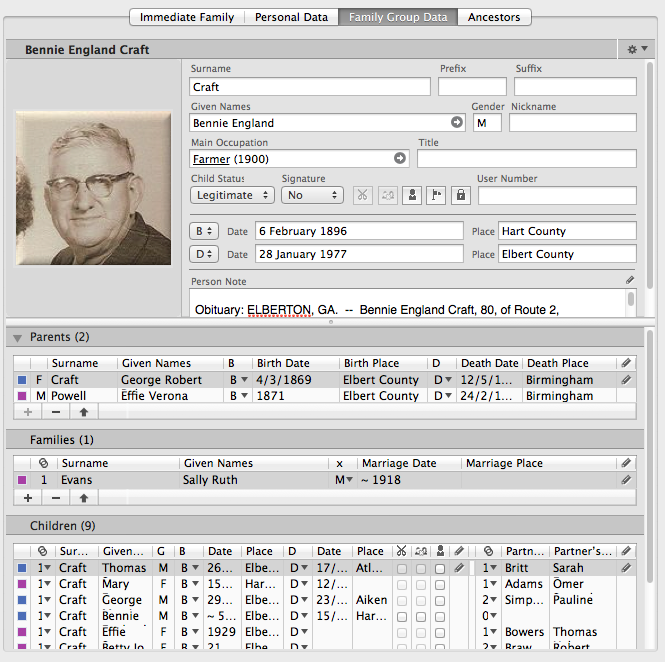 There are multiple view that you can navigate to, including the Immediate Family tab shown above, that summarizes the data in your tree for one person. 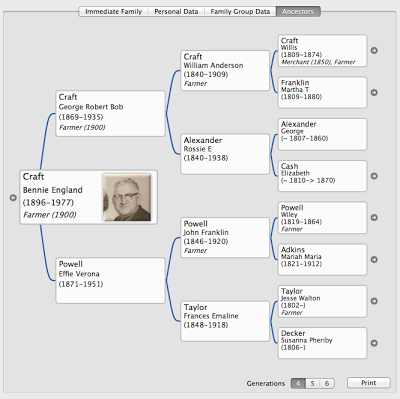 The Personal Data tab allows you to edit the information and view details, the Family Group Data allows you to edit the children and parents, and the Ancestors tab, which is a cascading pedigree chart. Each section is pretty much self explanatory and very user friendly. 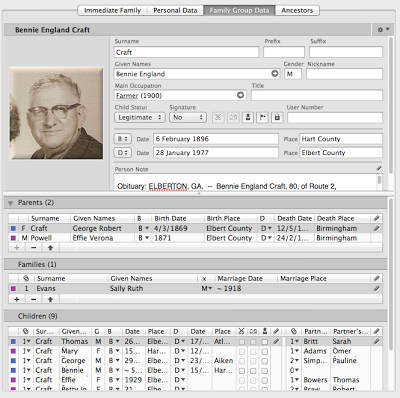 I'm not accustomed to being able to edit someone while viewing a different person (ie I can edit Bennie's son, Thomas, while viewing Bennie's Family Group Data tab) and can see where this function would be beneficial. The right side of the screen is Navigation and other data. The top right is a navigational feature to help you move through your tree. It took a minute to get used to, but once I did I really liked it. You have to make sure that you have your home person set properly, and these buttons will navigate through their direct line. 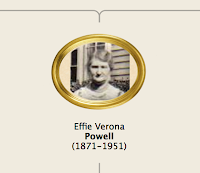 There's also a list of Relatives, and a Summary of people and events connected to the person you're viewing. 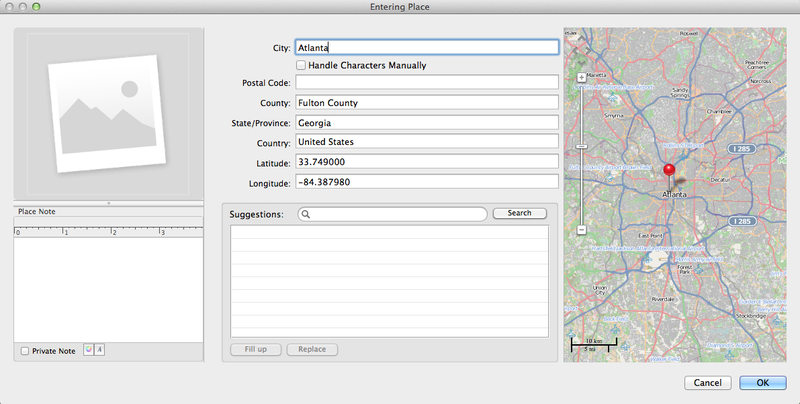 The Bookmarks feature is located in this panel and is helpful as well. I usually have a few ancestors that are central to my research for a variety of reasons. I can add them to the bookmarks menu for easy navigation. So those are the features that pertain to data entry and storage. But once you input your data, there are also a number of features that allow you to present the information in charts, reports and book formats. The Book feature is very nice, but also a bit limited. There are a lot of different settings that allow you to include or exclude different data sets, but you are pretty much set in the template. 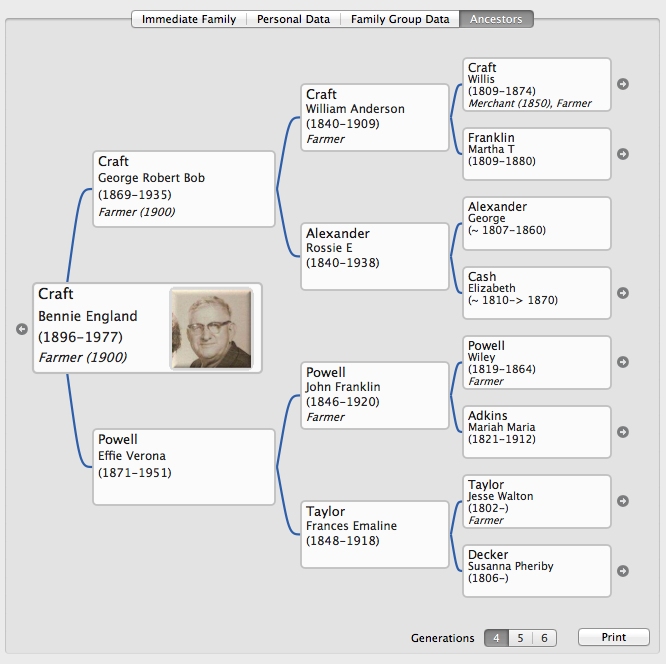 You can create ancestor books or descendant books an then further edit them in your own word processing software. Depending on how much you like the template used to create the book, you might do very little editing, or you might do a lot. Expect to play with this feature a few times to really understand what your book will look like. But once you get your settings right, you will have a nice booklet that you can print out an share with family, or even work toward publishing (though for that you'll really want to personalize it). The Reports (or Sheets as they are called), are much like any other software program, with person and family group sheets. Each one can be created in a small variety of professional looking templates, which can be personalized. 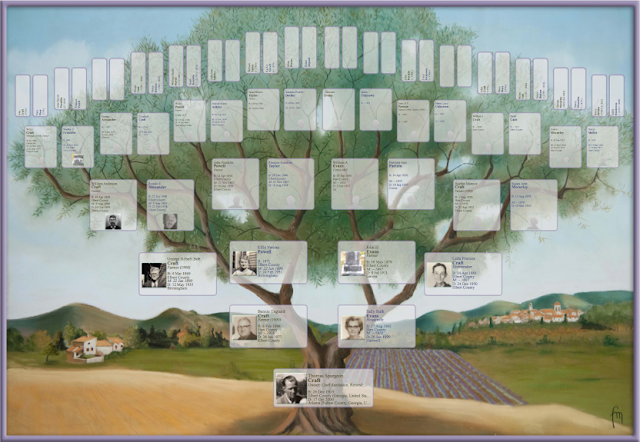 Also impressive are the Designed Charts, which put your family tree into graphics that you probably wouldn't mind framing. There aren't as many formatting options here, probably due to the restraints of the templates. Overall, I really like Heredis. There is a bit of a learning curve, but for the most part my Gedcom imported easily, with sources being the only data that did not import properly (I never can seem to import them properly into any software). Even my photos imported once I told them where one was located. The European dates get me, and I'd love to be able to reformat all the dates that display in the software. Another thing I find a little strange is the way places are presented. For example: Elberton (Elbert County, Georgia, United States). There seems to be an emphasis on the city, with county, state and country presented as an afterthought. Perhaps this is a European thing? Finally, Heredis does not automatically save changes. Every so often a window will pop up asking if you want to save your changes. I'm used to software the automatically saves, so this is annoying to me. Heredis also works with mobile versions for iPhone, which I have not yet tried. If you are in the market for new genealogy software, I would certainly give Heredis a try. You can download a free trail version on their website and decide for yourself. I hope I'll enjoy it as much as you do.